Leather Holder for 8" DMT Stone - ONLY £8.99 - SAVE £1! DMT D8E Dia-Sharp® - continuous diamond bench stone. 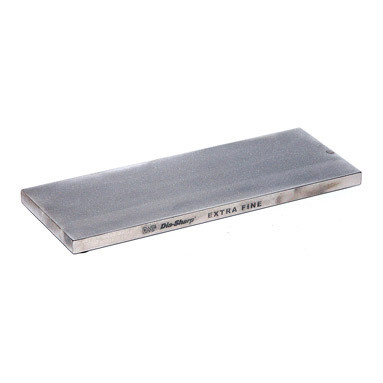 Guaranteed not to hollow or groove, DMT’s precisely engineered Dia-Sharp Bench Stone with continuous diamond surface assures consistent, even sharpening every time. Extra-Fine diamond (9 micron / 1200 mesh) to polish and refine a razor edge after sharpening with a coarser diamond. The 8" length is great for both long and short knives providing cutting edge performance for a quick, keen edge on small contact areas and pointed tools. Size: 8" x 3" x 0.375" (203mm x 76mm x 10mm). Sharpening surface accommodates range of edges - from large knives to small pointed tools. Extra-Fine diamond to polish and refine an edge. Sharpens knives faster than conventional stones with DMT's monocrystalline diamond surface. No oil is needed-sharpen dry or with water. Durable construction will provide years of consistent performance and reliable service.